I wanted to know the watts used by just the SuperServer Workstation, and the cost. Since my aging Kill A Watt shows some signs of damage (see video below), and doesn't do running totals because it has no battery, the search for a new option began. I had first tried out the P3 P4490 Kill A Watt Edge Energy Monitor with its handy remote display. I was quickly annoyed by the poor usability, along with difficulty turning off the unneeded/unwanted motion sensor. With no battery, not only does it not track power use over time if power is interrupted even briefly, but it also looses your preference to disable that motion sensor. RMA time. Floureon Power Meter at Amazon. I situated the Floureon within my line-of-vision when working at my desk. Now I know at a glance how busy my SuperServer Workstation is, without having to push any buttons. What the Floureon lacks in grace (Floureon-escent? ), it makes up for in features and relative ease-of-use. In the video below, you'll see me unbox it and get it running quickly, without reading a manual. I really wasn't planning on tinkering with this set-it-and-forget-it device for very long, and I'm glad I didn't have to. 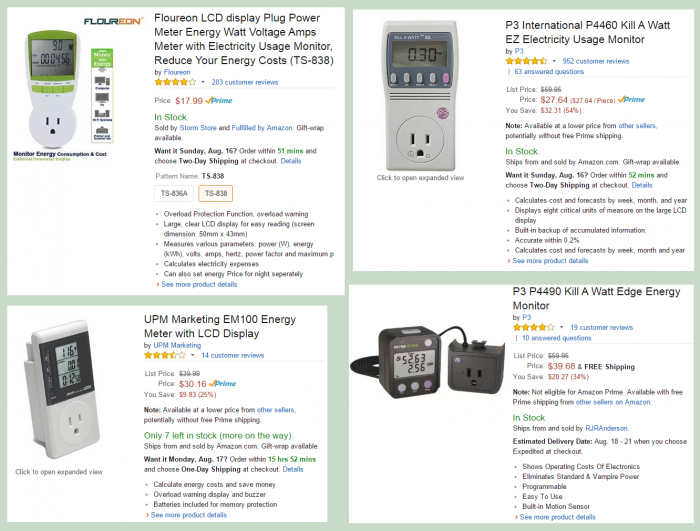 Unlike Kill A Watt products, you get a decimal point for the watts being used. In the video, you'll also notice a 10.5V readout on the Floureon (for an iPhone 6 Plus) versus 12.0V on the Kill A Watt EZ (for the same iPhone 6 Plus). I'm guessing the Kill A Watt is more accurate, while the Floureon is more precise. It's very affordable, cost is about half of many alternatives. You can save more by getting the two pack. It's easier to use than the UPM Marketing EM100 Energy Meter I also have. The included 2 LR44 button cell batteries keeps the unit going, handling power outages without loosing your running totals. You can replace those 2 batteries while the Floureon is plugged into AC power, avoiding any data loss. The display quality is only average, a bit low in contrast. The color, not the most discreet (all black would be nice). Floureon display rounds to 60Hz, the Kill A Watt EZ shows 60.0Hz. This is important when tuning a generator to output exactly 60Hz. While the display type will require some ambient light to see, the Floureon fits the bill for me. My budget, and my need. I can see how many watts my PC is using at a glance, and I can see exactly how much it's costing me to run over time, as I continue my quest to slash costs around my home. Unboxing, programming the cost per kilowatt hour, testing. I've tried all 4 of these. Core i7 laptop with a power hungry GPU. This means my overall watt burn will be cut down dramatically very soon. In the picture above, that 85.5 watts for the SuperServer Workstation is under heavy BurnInTest load. That little PC idles under 40 watts (55 watts with 3.5" drives added), yet can run dozens of VMs and have its Windows 10 VM outputting to up to 3 4K displays!